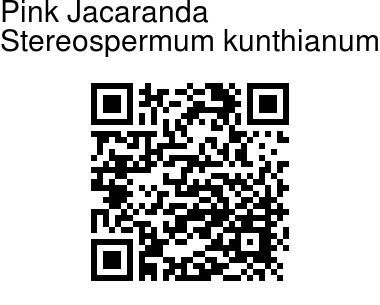 Pink Jacaranda is a slender tree to 15 m tall. The trunk is rarely straight, and the branches are also crooked. Flowers are borne in a drooping panicle of pink or purplish, trumpet-shaped flowers which are borne when the tree is wintering. 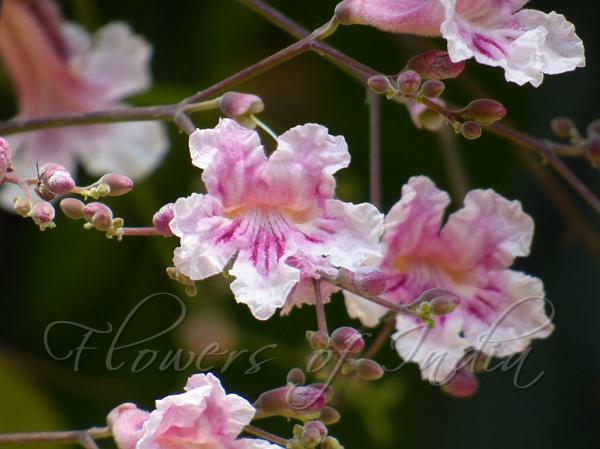 The tree in flower is very showy and well worth cultivation as an ornamental. Sepal cup is bell-shaped, 5-6 mm long and almost hairless. Flowers are about 5 cm long, with the tube softly velvet-hairy. Fruits are slender, flat, paired pods up to 60 x 1 cm, cylindrical, drooping, spirally twisted, smooth, splitting in two and releasing many flat, long, narrow seeds winged at each end, 2.5-3 cm long. The remains of the pods persist on the tree for several months. The alternate leaves are imparipinnately compound and some 25 cm long; leaflets are nearly opposite with one at branch-ends leaflet, and with short, soft hairs, oblong to oblong-elliptic in shape, green and hairless above, yellowish-green with prominent venation below, tip somewhat narrowed, and the base tapering. The leaf margin may be entire or sometimes toothed in coppice shoots, while leaflet-stalks are virtually absent. Leaf-stalks may be up to 7 cm long, and are caniculate. Immature leaves are occasionally toothed and hairy. Pink Jacaranda is native to Africa.